FET Flagships are ambitious large-scale, science-driven, research initiatives that aim to achieve a visionary goal. The scientific advance should provide a strong and broad basis for future technological innovation and economic exploitation in a variety of areas, as well as novel benefits for society. FuturlCT is a FET Flagship project using collective, participatory research, integrated across the fields of ICT, the social sciences and complexity science, to design socio-‐inspired technology and develop a science of global, socially interactive systems. The project will bring together, on a global level, Big Data, new modelling techniques and new forms of interaction, leading to a new understanding of society and its co-‐ evolution with technology. It will place Europe at the forefront of a major scientific drive to understand, explore and manage our complex, connected world in a more sustainable and resilient manner. The European Physical Journal does not spring to mind as the first place to look for work on the future of education – but its Special Topics edition has an explicit focus on advances in Complex Systems, including socio-technical-economic systems, not just physical or biological. So it’s very satisfying to point to a more detailed account of the thinking behind the proposal, which we’ve just published as an open access special issue of EPJST. Abstract: Education is a major force for economic and social wellbeing. Despite high aspirations, education at all levels can be expensive and ineffective. Three Grand Challenges are identified: (1) enable people to learn orders of magnitude more effectively, (2) enable people to learn at orders of magnitude less cost, and (3) demonstrate success by exemplary interdisciplinary education in complex systems science. A ten year ‘man-on-the-moon’ project is proposed in which FuturICT’s unique combination of Complexity, Social and Computing Sciences could provide an urgently needed transdisciplinary language for making sense of educational systems. In close dialogue with educational theory and practice, and grounded in the emerging data science and learning analytics paradigms, this will translate into practical tools (both analytical and computational) for researchers, practitioners and leaders; generative principles for resilient educational ecosystems; and innovation for radically scalable, yet personalised, learner engagement and assessment. The proposed Education Accelerator will serve as a ‘wind tunnel’ for testing these ideas in the context of real educational programmes, with an international virtual campus delivering complex systems education exploiting the new understanding of complex, social, computationally enhanced organisational structure developed within FuturICT. 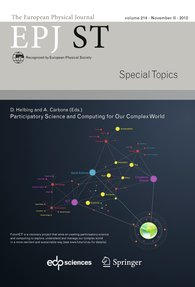 “As in many other fields, there is now active interest in the possibility that the concepts and tools of complexity science hold the promse of providing a new, more rigorous language and suites of computational tools for systemic thinking within educational research. These could enable possible futures to be mapped, modelled, simulated, and rendered in appropriate forms to help both researchers and practitioners to understand and, where appropriate, choose to act differently to achieve their intended outcomes. A central claim to be investigated in this research programme is that complexity science provides a language for transdisciplinary learning-centred discourse between system stakeholders, serving as reference points for modelling and, suitably communicated and embodied in tools, for educational leaders, and learners. For instance, autopoiesis is relevant to the emergence of learner identity in co-constructed domains of meaning, and hence for the way we approach learning as well as school change. Dissonance, defined as conflict between agents and processes, creates a space for deep learning when agents have the capacity to hold conflicting ideas in tension. Emergence focuses attention on the quality of relationships for creative learning and leadership in complex organisations. Resilience has been identified as key to learning to learn, and has been operationalised as a formally modellable quality in individual learners, not just socio-technical collectives . To take another example, the evidence is that efforts to manage educational systems (whether at national or institutional level) which do not take into account complex systems dynamics, do not result in sustained school improvement: standards in schools across the developed world are plateauing, as measured by student outcomes . There is a pressing need for management and self evaluation processes  which can account for such complexity in order to facilitate, value and enhance the breadth and range of student outcomes. The evidence emerging from these new approaches is that systemic transformation is indeed possible (e.g. [25–28]). Working with the FuturICT consortium has been a fascinating experience so far, and if we are successful, the start of what should be a remarkable intellectual journey. For great introductions to the notion that large datasets can give us insight into human societal dynamics, we’re working with Philip Ball, an award-winning science journalist. 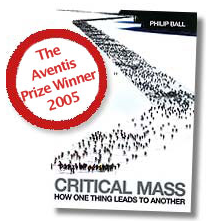 He’s written a brilliant historical contextualisation of the notion of a “physics of society”, controversial as this is — check out Critical Mass – and is helping us explain Why Society is a Complex Matter.